Looking back on the significant contributions women have made to our city in politics, the arts, and more. Ed. note: Tales From the Dallas History Archives is an ongoing series in which we employ a Dallas Public library archivist to dig through public collections for forgotten photographs. The photos come from the Dallas History and Archives Division. To learn about how you can do your own digging, see the note at the bottom of this post. Women have shaped Dallas’ history since its beginnings, and by understanding their influences on the city, we can better understand its past while envisioning its future. You can feel the impact of Dallas’ trailblazing women inside these photos. Let’s dive in. This photograph titled Anita Martinez boarding plane with other members of a Dallas Chamber of Commerce delegation is one of many images related to Anita Martinez (1925-), who was the first female Mexican-American to be elected to the Dallas City Council in 1969. 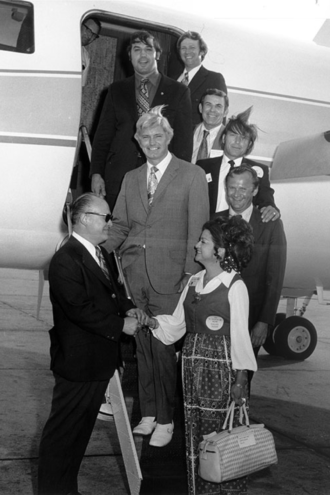 Anita Martinez boarding a plane with other members of a Dallas Chamber of Commerce delegation, no date, Greater Dallas Chamber of Commerce Collection. She has continued to serve the people of Dallas in subsequent decades through various roles. The Anita Martinez Collection contains photographs, speeches, newspaper clipping files, and correspondence related to her career and pursuits in politics and community activism. Eddie Bernice Johnson (1935-) is the first African American woman in Dallas elected to public office, winning election to the Texas House of Representatives in 1972. The image below depicts Johnson at a press conference in 1975. Johnson was elected to the U.S. House of Representatives in 1992, where she continues to serve. 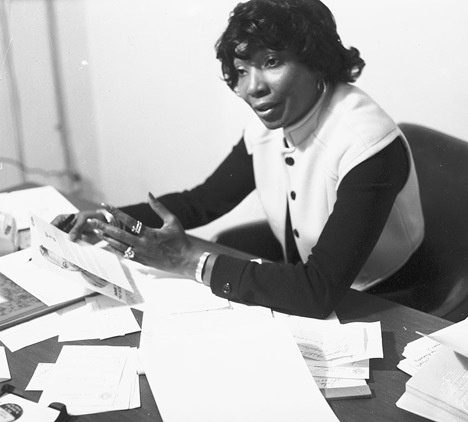 E. (Eddie) Bernice Johnson, member of Texas House of Representatives, press conference, 1975, Marion Butts Collection. Another important figure in the history of Dallas is Juanita Craft (1902-1985), who was a civil rights activist and NAACP leader. Craft is the first African American woman in Texas history deputized as a poll tax collector, and she served on the Dallas City Council from 1975-1979. The Juanita Craft Collection has photographs, correspondence, and ephemera related to her personal items and interests, civil rights and the NAACP, Dallas city issues and council papers, and more. This undated photograph is titled Juanita Craft, Thurgood Marshall and other civil rights leaders. 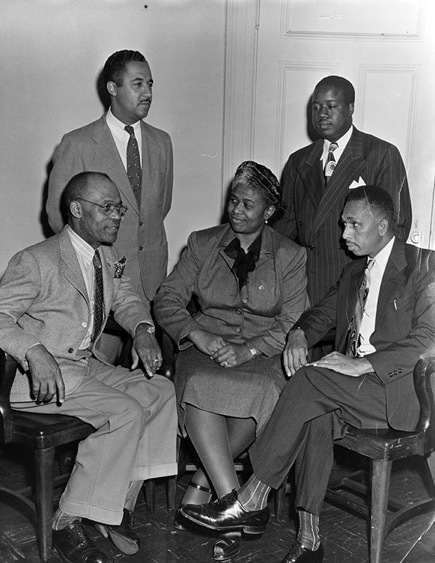 Juanita Craft, Thurgood Marshall and other civil rights leaders, no date, Juanita Craft Collection. Many famous female entertainers visited the Dallas of yesteryear. This 1944 photograph depicts actress Lena Horne with Elgin Hychew, a Dallas Express reporter. 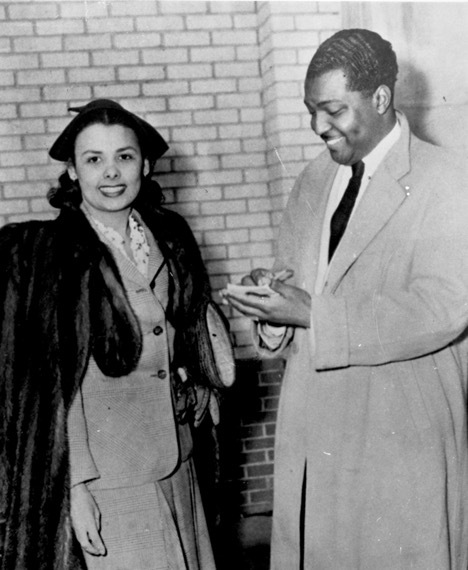 Lena Horne with Elgin Hychew, a Dallas Express reporter, circa 1944, Marion Butts Collection. 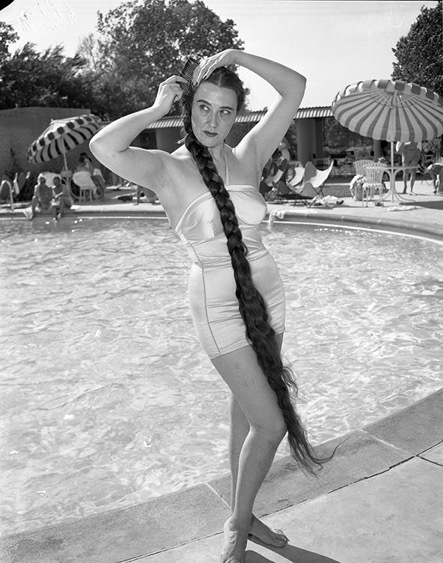 Fans of opera may enjoy this 1953 photograph titled Blanche Thebom, Metropolitan Opera star, by the pool at the Stoneleigh Hotel. Blanche Thebom at the Stoneleigh Hotel, Hayes Collection. Comedy entertainer Minnie Pearl (Sarah Cannon) is depicted in Dallas at the Fairmont Hotel in this 1978 photograph. 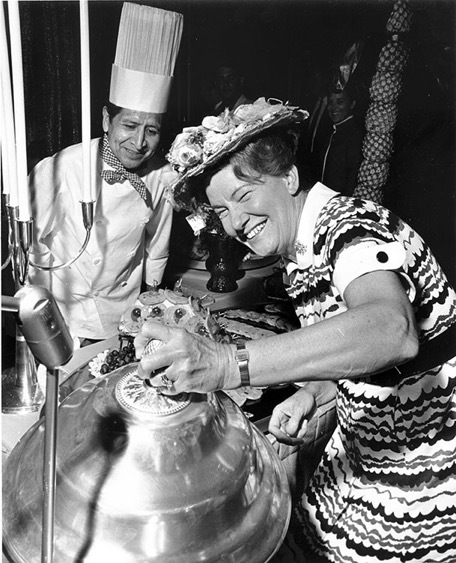 Minnie Pearl (Sarah Cannon) at the Fairmont Hotel, 1978, Clint Grant Collection. There’s also this 1951 photograph depicting Margo Jones (1913-1955). 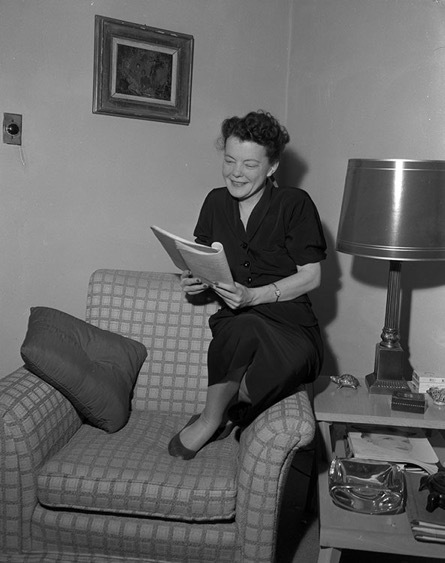 Jones was a theater director who founded a permanent professional repertory theater in Dallas dedicated to staging new plays and classics that attracted critical acclaim and box office success and earned her an international reputation. Margo Jones, 1951, Hayes Collection. The Archives Division actually holds an entire collection on Jones, the Margo Jones Collection, including photographs, the daily working files of the Margo Jones Theatre, and Jones’ personal records and correspondence. Brandon Murray, a librarian and archivist in the Dallas Public Library’s Dallas History & Archives Division, writes about North Texas history for D Magazine. With questions about the many fascinating photographic resources available, contact Dallas History & Archives Division, Dallas Public Library at (214) 670-1435 or email [email protected]. Interested in learning more? Try searching online in the catalog. Go to “Advanced” and use the “Limit By” option to select “Digital Archive,” then type in your topic.